Enjoy Marco's beautiful sunshine and stunning sunsets, all from the lanai, pool deck or dock. House has WiFi throughout, including the pool deck. Our newly furnished home with 'Tommy Bahama' decor awaits you! Our large, three bedroom, 2.5 bath home rests on a large and sunny western exposure lot with a direct access canal to the Gulf. All within walking distance to Tigertail Beach. Master bedroom boasts a brand-new king-size bed, tropical furnishings and a 32' flat screen TV plus a luxurious granite top bathroom. Second bedroom has a brand-new queen bed with views of the water and mango trees. Watch for dolphins and manatees from the third bedroom with two new twin beds. Family room has a queen-size sofa sleeper and a 45' flat-screen TV with DVD/VHS player. Glorious kitchen has granite countertops, top of the line appliances and all the amenities you need to make your stay comfortable. Open up the lanai doors from the master bedroom, dining room and kitchen to a huge lanai pool area. Enjoy desirable sunny southern exposure in the solar heated, large pool. Both bathrooms have granite countertops and luxurious showers. Minutes to the Tigertail Beach area. Beautiful water views with southwest exposure. Sit on the deck, lanai or dock and watch the gorgeous Marco sunsets! Direct access water access to Collier Bay. Strong internet connection for your mobile devices within the house and out at the pool area. 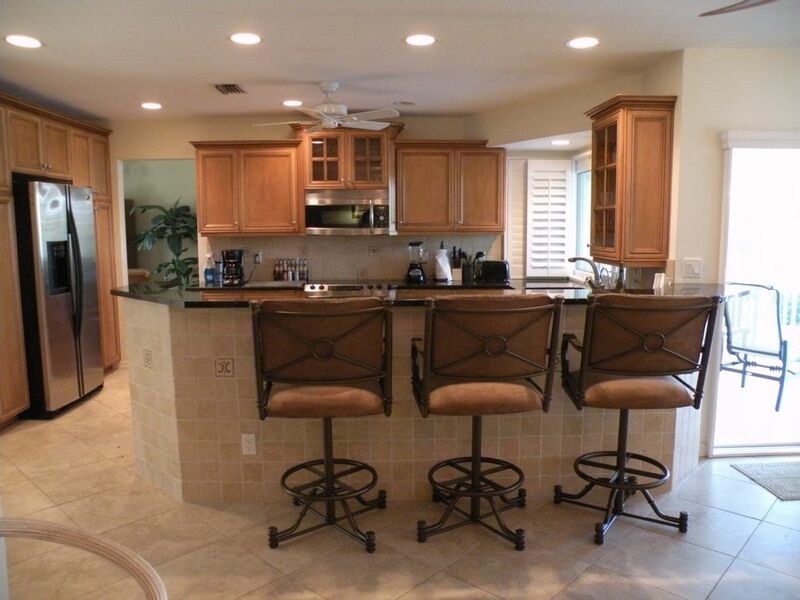 Well appointed kitchen with updated appliances. granite and plenty of seating areas. Seating for six at the dining table. Covered lanai with lounge chairs and table seating for six. large pool deck area with lounge chairs. We have a high chair, portable crib, and baby bath at the house. Please note that we have a one-pet limit and an extra charge for cleaning may be assessed for pet. Updated bathrooms and kitchen. Great location! Roomy home with master bedroom on one side of the house, and other bedrooms on the other side. We enjoyed our stay here! We had a great stay in this home during the week after Easter. The home is in good overall condition, and the pool and screen-in patio are great. There are lots of useful amenities: bikes, fishing rods, beach chairs, etc. The location is very good, on a quiet cul-de-sac and close to Hideaway Beach (good for us since we have relatives there), Tigertail Beach, and short drive to the Winn-Dixie. Well appointed home, spacious, good location, reasonable rental fee. My wife and I stayed at this home for two months in 2012 and 2013. We really enjoyed ourselves. The house was really nice and the location was great. We actually saw a dolphin in the canal behind the house one year and a manatee this year. The home owners were good to deal with and very professional. The solar heated pool was really nice. If we return to Marco Island, we wouldn't hesitate to stay here again. The home was comfortable, beautiful and clean. The owner's were easy to work with and timely in their responses to questions about the property. The pool and grounds are well maintained. The kitchen was well equipped, and the beds are comfortable. Note that there is no bathtub in either bathroom, just two very roomy showers. We had such a wonderful time, my 5-year old didn't want to leave! There are also 2 beach umbrellas, chairs and a cart to carry everything to the beach. Some notes about Tigertail Beach: if you have small children, plan on driving to the beach and parking ($8) all the way at the end of the parking lot to get you closer to the beach, which is quite a long walk from the lot. If you have older children (10+) they could make the walk from house. Even with our small children (7, 5, <1), we walked to the lagoon area where you can rent a kayak, eat lunch at the cafe, or visit the playground. The lagoon at Tigertail is not for bathing. I definitely recommend this property! I stayed at this house with my family for a week in April 2009. This is a very well-cared for house. We enjoyed the lanai with pool and the view of the canal behind it. We even saw several manatees put on a show for us right at the dock. The homeowner was very pleasant to work with. The house is close to the beach and many restaurants. We also found many activities that we enjoyed, including an awesome jet-ski tour with Captain Ron. I'd highly recommend this house to anyone. Marco Island is home of the largest of Florida's Ten Thousand Islands. Once you cross the Jolley Bridge, you'll find yourself in an upscale resort area of lovely homes, condos, fine dining, shopping and miles of beaches. Recreational activities are plentiful with boating, parasailing, waverunners, shelling, manatee and dolphin watching. Outlet malls are nearby and upscale Naples is a short drive away.